Alternative Signs is Slidell Louisiana’s number one sign contractor relied on by national and local businesses daily to complete their sign surveys, installations, service and removals. Alternative Signs engages in sign installations throughout the city of Slidell on a regular basis. Our installers follow engineered drawings for every sign that they install to ensure it is being accurately installed. 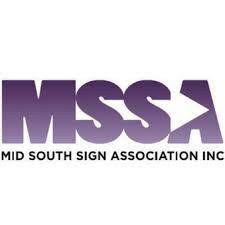 Alternative Signs’ crews have over 25 years of experience with installing, removing and servicing signs. 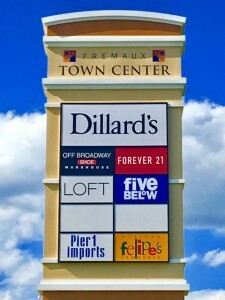 The city of Slidell has various large malls and shopping centers such as the North Square Mall, Sand Hill Mall, and the newly constructed Fremaux Shopping Center. A slew of retailers have been moving into the Fremaux Shopping Center in Slidell Louisiana and Alternative Signs is their prime sign contractor. 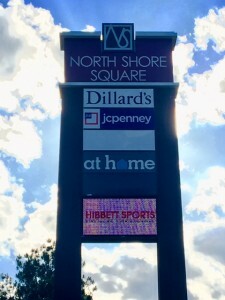 Alternative Signs has performed in several sign projects from start to finish for retailers such as Loft, Forever 21, Best Buy, Academy, JC Penny and much more. Our national companies trust their brand with our company and know their sign projects will be handled with the utmost importance and professionalism they require. Alternative Signs has exceedingly skilled sign service technicians ready to be dispatched to Slidell Louisiana in a moment’s notice. We have the fastest turnaround for emergency service calls. Alternative Signs’ service crews can troubleshoot and repair any sign or light fixture there is. Neon, DHO fluorescent lamps, metal halide bulbs, ballasts, transformers, retrofit to LED? We can handle it! 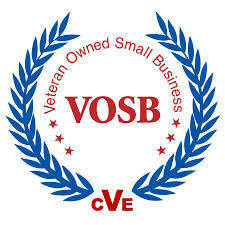 We provide service you can rely on 24 hours a day, 365 days a year! Opening a new business in Slidell, LA? Alternative Signs employs several highly skilled surveyors that we can send to your new location in Slidell and they will achieve all measurements and information necessary to get your sign installed properly. Our surveyors know exactly what information is imperative for a successful sign installation and will communicate any obstacles that may come up. Send our survey team to your site set to open in Slidell Louisiana prior to your sign installation and we ensure your sign installation project will be smooth sailing. Alternative Signs holds a current sign contractor’s license and electrical contractor’s license for the city of Slidell, St. Tammany Parish and the state of Louisiana. Alternative Signs works with the local municipalities to acquire permits on a regular basis and our administrative staff is very accustomed on what applications, drawings, etc. are needed to get your sign permit. Alternative Signs is also the number one sign contractor for local hospitals in the Slidell area such as Slidell Memorial and government entities such as the freshly constructed Veterans Affairs outpatient facility. Alternative Signs manufactured and installed several directional signs for both facilities in Slidell Louisiana. We are also the main service provider responsible for their parking lot lighting and area lighting maintenance and their sign maintenance. As in nearly every city throughout the state of Louisiana, Slidell is home to many festivals throughout the year such as the Crawfish Festival. Alternative Signs is the number one provider of all promotional signage in the Slidell area. Huge sale? New products? Grand Opening? Call Alternative Signs today for all your promotional signage needs in Slidell, LA today!